For a long period of time wood was the only energy source of Paris and 90% of this wood came from the deep forests of Burgundy. 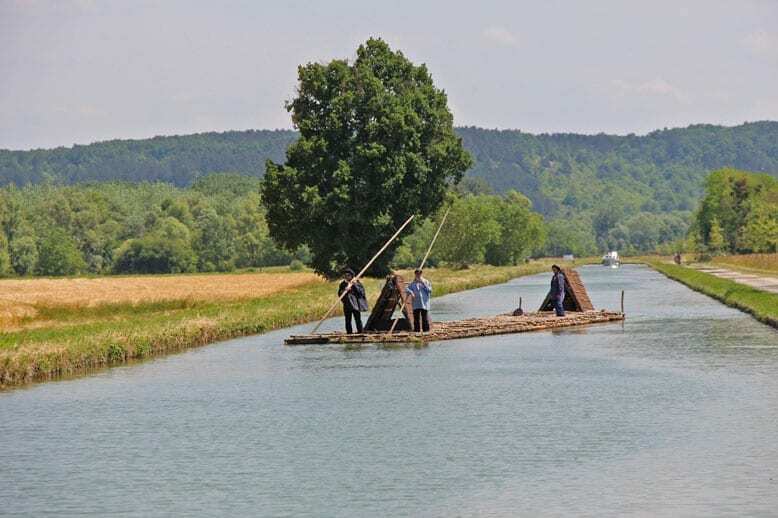 For over 300 years hundreds of 87 yards long rafts made of big logs were carried along rivers from the Morvan Massif to Paris every year. This year a bunch of passionate volunteers called Flotescale decided to revive this tradition. 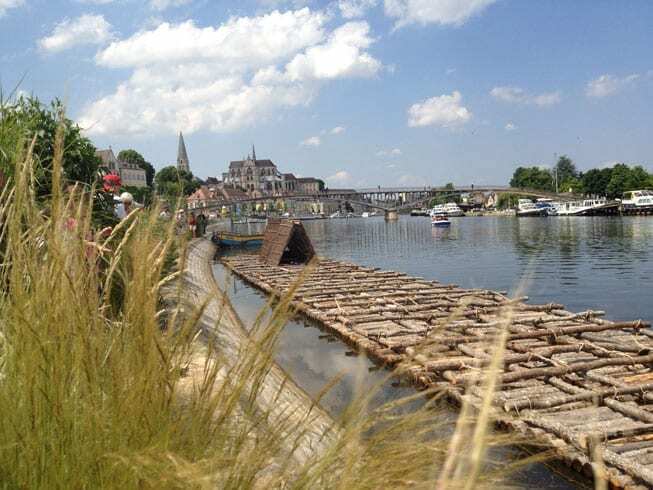 Leaving Clamecy on June the 6th the raft will reach Paris on June 27th after a 190 miles long journey. On July the 5th get ready to make unusual photos when it will sail under the Parisian bridges driven by men wearing traditional costumes and passing below Notre Dame or the Eiffel Tower! It all started in the middle of the 16th century when the 300,000 Parisians of the time were totally dependent on wood to heat their houses and to eat. No wood meant no bread and no bread meant starving and the possible resulting riots. 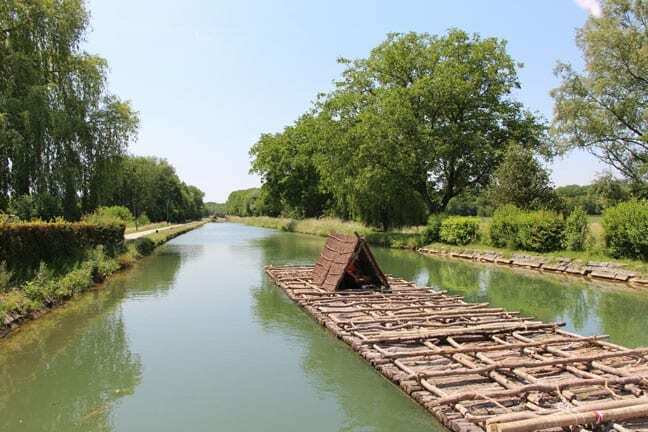 The forest around Paris had already been decimated and Henri IV wisely decided to create a new system to bring wood cut in the huge Morvan forests by driving floating logs downstream to Paris. This trade went on until the end of the 19th century when wood was gradually replaced by coal and the last raft reached Paris in 1877. You can’t stop the march of progress! Thousands of men worked year-round to provide Paris with the essential wood. Lumberjacks chopped trees all winter long then the logs were allowed to dry for a whole year before being sold to wood market traders, the wholesalers of the time. Each log was then marked at both ends with the individual label of each trader in order to be identified when making the rafts. It took hours and hours to dozens of men with specific hammers to achieve this boring labour. 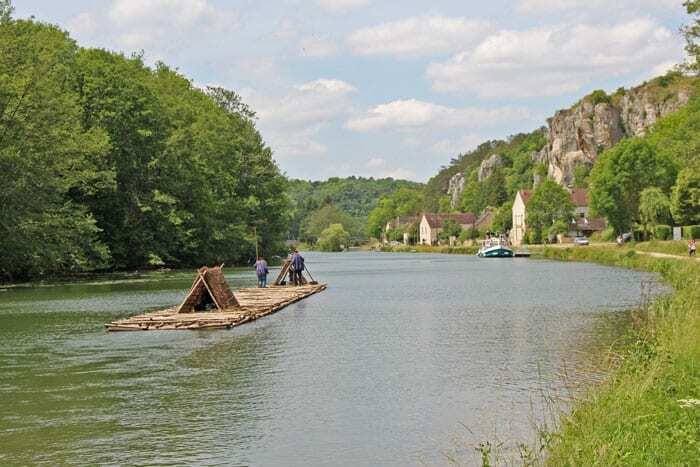 Later the logs were thrown into crooks following the flow to bigger streams and rivers to finally get to Clamecy on the Yonne River. Making the rafts was a tremendous job: men, women and even children helped to sort out and gather together 200 cubic metres of wood belonging to only one wood trader to make one raft. Up to one million cubic metres of logs were thus divided into thousands of rafts. Can you imagine all these logs turning the rivers into a wave of wood? 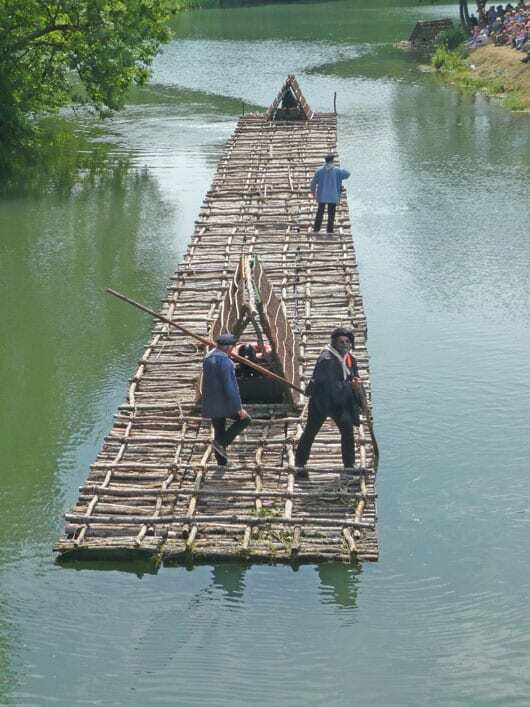 At least two men were needed to drive each raft along the rivers and they had to walk all the way back from Paris to their villages during 4 or 5 days! These were tough men able to cope with the treacherous currents of the Yonne River avoiding the bridges’ pylons and manoeuvring among the numerous boats. But this hard work made a living for 500 families. Once in Paris the rafts were dismantled and the wood traders were able to sell the logs to the Parisians ensuring in their own way the Parisian harmony. This year historical pageant is a unique event and won’t probably be seen again before long. So if you happen to be in Paris between 27 June and 5 July you must not miss it! For 8 days an ephemeral museum will be open in the Bercy port in eastern Paris. There you will learn everything about the men working for this impressive ancient wood sector and have the opportunity to meet the passionate people who made this incredible re-enactment possible. Specialities and wines from Burgundy will certainly help to create a cheerful atmosphere! But of course the main attraction will be on Sunday July the 5th when the raft will sail on the Seine River. Wake up early to be at Bercy by 8 am to see it leave the port, watch it going past the cathedral Notre Dame by 8.30 am or past the Eiffel Tower by 10 am. You can even follow it from the banks if you can walk fast enough and enjoy a beautiful walk. If the weather forecast can be trusted it should be a hot and sunny day!